Consider the interface between two plasmas containing magnetic fields of different orientations. The simplest imaginable field configuration is that illustrated in Figure 7.7. 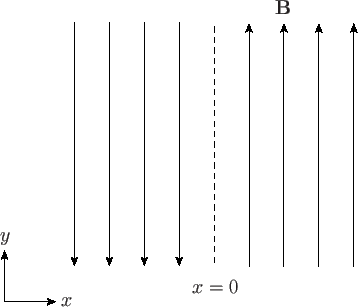 Here, the field varies in the -direction, and is parallel to the -axis. The field is directed in the -direction for , and in the -direction for . The interface is situated at . The sudden reversal of the field direction across the interface gives rise to a -directed current sheet at . Figure 7.7: A reconnecting magnetic field configuration. With the neglect of plasma resistivity, the field configuration shown in Figure 7.7 represents a stable equilibrium state, assuming, of course, that we have normal pressure balance across the interface. But, does the field configuration remain stable when we take resistivity into account? If not, then we expect an instability to develop that relaxes the configuration to one possessing lower magnetic energy. As we shall see, this type of relaxation process inevitably entails the breaking and reconnection of magnetic field-lines, and is, therefore, termed magnetic reconnection. The magnetic energy released during the reconnection process eventually appears as plasma thermal energy. Thus, magnetic reconnection also involves plasma heating. In the following, we shall outline the standard method for determining the linear stability of the type of magnetic field configuration shown in Figure 7.7, taking into account the effect of plasma resistivity. We are particularly interested in plasma instabilities that are stable in the absence of resistivity, and only grow when the resistivity is non-zero. Such instabilities are conventionally termed tearing modes. Because magnetic reconnection is, in fact, a nonlinear process, we shall then proceed to investigate the nonlinear development of tearing modes. Here, is the equilibrium plasma density, the perturbed magnetic field, the perturbed plasma velocity, the perturbed plasma pressure, and use has been made of Maxwell's equation. The assumption of incompressible plasma flow is valid provided that the plasma velocity associated with the instability remains significantly smaller than both the Alfvén velocity and the sonic velocity. respectively, where use has been made of Equations (7.174) and (7.175). Here, denotes . The term on the right-hand side of Equation (7.182) represents plasma resistivity, whereas the term on the left-hand side of Equation (7.183) represents plasma inertia. Equation (7.185) is simply the flux-freezing constraint, which requires the plasma to move with the magnetic field. Equation (7.186) is the linearized, static force balance criterion: . Equations (7.185) and (7.186) are known collectively as the equations of ideal-MHD, and are valid throughout virtually the whole plasma. However, it is clear that these equations break down in the immediate vicinity of the interface, where (i.e., where the magnetic field reverses direction). Observe, for instance, that the normalized ``radial'' velocity, , becomes infinite as , according to Equation (7.185). is the so-called hydromagnetic timescale. The tearing mode stability problem reduces to solving the resistive-MHD layer equations, (7.187) and (7.188), in the immediate vicinity of the interface, , solving the ideal-MHD equations, (7.185) and (7.186), everywhere else in the plasma, matching the two solutions at the edge of the layer, and applying physical boundary conditions as . This method of solution was first described in a classic paper by Furth, Killeen, and Rosenbluth (Furth, Killeen, and Rosenbluth 1963). that is, by the jump in the logarithmic derivative of to the left and right of the layer. This parameter is known as the tearing stability index, and is solely a property of the plasma equilibrium, the wavenumber, , and the boundary conditions imposed at infinity. Thus, the matching parameter is determined from the small- asymptotic behavior of the Fourier transformed layer solution. This ordering, which is known as the constant- approximation [because it implies that is approximately constant across the layer] will be justified later on. Here, is an arbitrary constant. that is, provided that the tearing mode does not become too unstable. When then , according to Equation (7.210), giving . It is clear, therefore, that if the Lundquist number, , is very large then the resistive-MHD layer centered on the interface, , is extremely narrow. (i.e., ), which is in agreement with Equation (7.201).